After hearing more details in Strand’s 4/12 presentation, we still oppose Strand’s proposal to cut down the heart of the forest and convert the space into above ground wetlands, including permanent deep standing water and pollutant filtration. Although the most recent proposal is an improvement on previous plans, we believe it still gets the important parts wrong. The proposed solution would undoubtedly achieve some storm water run-off mitigation, but we believe it puts children in harm’s way, robs Winnetka of a cherished and unique forest, concentrates pollutants near a historic neighborhood school and more. Crow Island has been a special part of our community for nearly 100 years. It is a special opportunity to have such a wonderful educational, ecological and social resource so close to our homes so that we can enjoy the beauty and tranquility of a mature forest hidden right in our own neighborhood. When friends from outside of Winnetka come to visit, they often say how amazing it is that we have this tucked-away gem. Winnetka residents understand that Crow Island Woods is one of the things that makes Winnetka special. Park District surveys report every year that our exceptional neighborhood parks (of which Crow Island Woods is the undoubted jewel) are residents’ favorite things about Winnetka. If you walk in the woods with your family or dog, have camped in the woods with the scouts, or have come to the many parties held at the shelter or fire pit, you understand why Crow Island is special. You’ve seen how people lived in the 19th century at the Schmidt-Burnham Log House, and celebrated our pre-European roots with the Indian Tree Circle. Even kids who attended another school nearby probably came to Crow Island to celebrate the legendary “Pioneer Days,” foraging in the woods for food, and enjoying the civil war re-enactment in the spring. Federal agencies opposed the Willow Pipe because of the sorts of pollution which would have been dumped into Lake Michigan. One of the implied purposes of this plan is to cause those pollutants to accumulate in the middle of our community. How safe or unsafe our particular community’s stormwater run-off might be is hard to judge, but especially for families with children or dogs, this will make Crow Island a less safe place to live and play. HAZARDS TO HUMANS & DOMESTIC ANIMALS: Avoid contact with eyes or clothing. Wash thoroughly with soap and water after handling and before eating, drinking, chewing gum, or using tobacco. When using this product, wear long-sleeved shirt, long pants, socks, shoes, rubber gloves and protective eyewear. If in eyes: Hold eye open and rinse slowly and gently with water for 15-20 minutes. Remove contact lenses, if present after the first 5 minutes, then continue rinsing. Call a poison control center or doctor for treatment advice. Have the product container or label with you when calling a poison control center or doctor or going for treatment. This pesticide is toxic to fish and aquatic invertebrates. Drift and runoff may be hazardous to aquatic organisms in water adjacent to treated areas. This product may adversely affect nontarget plants. To protect the environment, do not apply directly to or allow pesticide to enter or run off into storm drains, drainage ditches, gutters or surface waters. Do not apply near rivers, fish ponds, lakes, streams, reservoirs, marshes, estuaries, bays or oceans. Applying the product in calm weather when rain is not predicted for the next 24 hours will help to ensure that wind or rain does not blow or wash pesticide off the treatment area. Rinse applicator over lawn or garden area only. This product has properties and characteristics associated with chemicals detected in groundwater. The use of this chemical in areas where soils are permeable, particularly where the water table is shallow, may reult in groundwater contamination. Application around a cistern or well may result in contamination of drinking water or groundwater. Earlier Strand plans pitched the benefits of restoring Crow Island to its historical natural wet prairie conditions. To be truthful, though, this plan is neither natural nor a restoration of an earlier Crow Island Woods. First: Pumping accumulative run-off into Crow Island isn’t natural. Second: Crow Island Woods is the last nearby surviving remnant of the majestic oak woods which once covered much of the North Shore. The southern part of Crow Island Woods was historically a relatively high ground Red Oak Savanna — that’s why it was an “Island”! It was surrounded by some low-lying sedge meadows and other wet lowland areas that were eventually filled in or drained for the development of farm fields, housing and roads. Our homes and Crow Island School (built on six feet of landfill) were the wet prairie, not Crow Island Woods. Oak ecosystems are important for a variety of reasons, including some very relevant to our flooding plight. Due to their longevity, large stature, and vast canopies, oaks provide significant carbon storage, mitigate urban heat island effects, and reduce flooding. A single large oak can reduce 5,400 gallons of stormwater run-off and remove more than 1,000 pounds per year of carbon dioxide from the atmosphere, so a plan to cut down a mature oak forest to reduce flooding is inherently flawed. At one time Oak Savannas — forested areas where only 10-50% of the sky is covered by the mature oak canopy — were common in the midwest. Only about .01% (1 of ever 10,000) of those original savannas now remain, making Crow Island one of the most threatened kinds of Midwestern plant communities. This plan to cut down an endangered forest seems inconsistent with the “Tree City USA” award Winnetka is so proud to have received the past 23 years. There’s something kind of special about the children of Winnetka foraging in the woods on “Pioneer Days” under trees that were around during the pioneer days — in literally the only forest near us which survived European settlement. A Chinese proverb says “the best time to plant a tree is twenty years ago.” In the case of an oak forest — because oaks grow much more slowly than many other trees — it’s more like 100 years. Because of a mis-match between the Strand plan and where the trees actually are in Crow Island, only a small fraction of the existing trees will remain. The plan cuts down the healthy heart of the woods figuratively and literally, taking away nearly 50% of the forested area to make way for a marsh and sedge meadow. The remaining areas are already somewhat deforested — at the north by the emerald ash borer and the south by a 2007 microburst. What’s left will be only a sad remnant of a once-great woods. Nearly all communities (including ours) require fences around swimming pools to make sure unsupervised children don’t drown. The reason? There are about 3,500 fatal unintentional, non-boating related drownings in the United States each year. By comparison, about 50 Americans are killed by lightning. Even though statistically 70 times less dangerous, the Park District thinks lightning poses an unacceptable risk, preventing people from using its fields when an expensive warning system says there has been lightning within 15 miles. Deep water would probably make the most effective and attractive version of the Strand plan, but it would be stunning if our community allowed it in a public area so near to an elementary school, where children walk and play every day. The risk of kids falling through thin ice in winter and drowning is too much, and has been the downfall of plans like this which have been proposed here in decades past. At the presentation, Strand initially touted the benefits of having kids be able to interact with the water, and then agreed that they might need a way of keeping unsupervised kids away from it. Here’s how a stormwater retention pond near us in Glenview handles this. We don’t think this solution would retain the character of Crow Island Woods. Attractive Nuisance or Unattractive Nuisance? The attractive nuisance doctrine states that a landowner (in this case it would be the Village of Winnetka) may be held liable for injuries to children (even if trespassing on the land) if the injury is caused by any object (swimming pools, machinery, animals) on the land that is likely to attract children who may not appreciate the dangers therein. Note: Some courts consider even teenagers to be children, and the attractive nuisance doctrine can apply even if the object is unattractive, as long as it is deemed likely to pique interest. 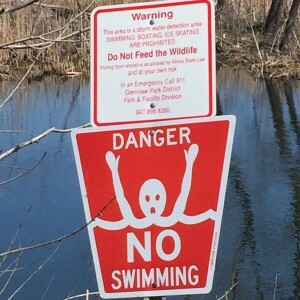 Because of the drowning risk, there’s no reason to believe that Winnetka would ever actually be able to put deep water in Crow Island Woods. But, that means we’re likely to end up killing yet more of our historic trees to get a much larger area of less attractive shallow water (because we need to store the same amount of stormwater horizontally rather than vertically) with a less diverse and balanced ecosystem. Per the Village of Winnetka Zoning Map, Crow Island Woods is zoned R2, which does not allow stormwater treatment facilities. Something no one picked up at the 4/12 meeting (but is apparent from looking Strand’s Powerpoint deck), is that only 35 homes are expected to be helped by the work envisaged in Phase 2 (The Crow Island Woods Phase) in a 100 year flood. That makes the average cost/home mitigation of Phase 2 very high in comparison with the costs of each of the three other phases. At about $468,000/home fixed, it’s over four times as much as the projected cost to help the 378 homes helped in the other three phases (about $110,000/each), and nearly eight times the cost per structure of Phase 3! Interestingly, Strand had not calculated the cost/structure mitigation prior to our confirming this data with them on 4/19. 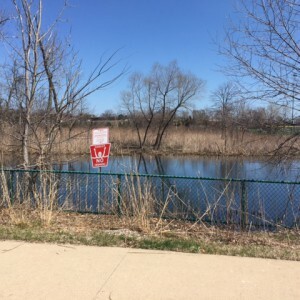 Save Crow Island Woods supports all our neighbors who are looking for stormwater relief, but we think that this phase of the project needs considerable further evaluation to see if flood control in south Winnetka can be accomplished at a lower cost and without harming Crow Island Woods. Is it worth spending so much money and destroying a local treasure which we enjoy every day for an issue which is predicted to happen only one day in 100 years? Is 100 Years the Gold Standard? Some individuals on the Village Council have alleged that “100 years” is the gold standard in stormwater planning right now. That may be a viable goal for constructive completely new developments in ideal conditions. But for already-built environments like Chicagoland, which face a completely different set of historical challenges, there is not evidence of this. For instance, most of our neighboring suburbs — like Wilmette, Northfield, and Highland Park — are currently meeting a “2-year” standard and are shooting for comprehensive “10-year” storm coverage. The voters of these villages have said that they many not even be willing to pay for going that far. The proposed rigid “Target Level of Service” suggested by the Village of Winnetka may be too high to be cost-effectively delivered upon. It will be a lot easier to find, afford, and implement a politically acceptable solution, if we as a community strive for no flooding during somewhat more frequent events, than in events which happen only once a century. Not only would an effective “10-year plan” minimize the damage from storms we’re likely to experience in our lifetimes and that of our children, it could reduce the damage of a “100 year event” to that of a more typical Chicago thunderstorm… something Winnetka residents can reasonably plan for. The next several years will be a disaster if you live next to, or around Crow Island Woods. While the envisioned work is being done, the Woods and the area around it will be noisy, crowded, and unwalkable… Not a great place to be. The medium term depends how the proposed project is implemented and your interest in manufactured landscapes: your privacy may be reduced. Your yard may smell bad from time to time because of algal blooms caused by the accumulation of phosphorus from lawn fertilizer. Your home may be worth less. With no offense meant to marshes and sedge meadows, nearly everyone agrees a home next to a mature woods enjoys a substantially higher value. A few have argued that the “new Crow Island” will be better, but if so we would expect to see individuals or funds swooping down to purchase properties near Crow Island Woods so that they can turn them around for a big profit after the project is complete. On the contrary, we’ve already heard of a home sale falling through because the buyers heard about this project. The Strand proposal shows planting of new trees in those areas around the edge of the retention basin, but it will take many years for those trees and their vision to fully mature… by which point a fair number of the current residents will have moved away or be dead! This project will actually substantially increase catastrophic flood risk for people living around Crow Island Woods. Should water containment fail due to a “200 year” flood, because a tree falls and blocks the outgoing conveyance, or any of the other ways complicated projects spectacularly fail, the water from a good portion of southern Winnetka will be directed toward residents’ homes near Crow Island Woods! The proposed Sunset road option to convey storm water west towards Crow Island Woods poses several unique challenges that may offset the minimal cost savings versus the other alternatives. West of White Oak Lane, Sunset is a single lane road and construction will therefore require closing the entire street, precluding use of residents’ driveways and hindering the access of public safety services, deliveries, maintenance etc., and causing significant interruptions to water & sewage services. Because Sunset has no curbs, parkways or sidewalks, the trunks of majestic 100 year-old trees stand within inches of the pavement on both sides. Digging to lay the proposed 10’x5′ box culvert will result in significant tree loss and forever change the character of the neighborhood. In addition, because Sunset road has broad curves, laying pipe in a way that minimizes flow impediment may require excavating well into residents’ front yards to straighten the line. The area is governed by several private road associations and securing their support for the proposal will add time and complexity versus other several options which have been discussed. Should the residents who love Crow Island Woods — especially those who don’t benefit from phase 2 of the proposed project — bear the short- and long-term burdens described above for the issues of Village residents who live in other areas? Because of Winnetka’s decision to adopt “home rule” in 2005, a handful of village trustees could move forward with this plan at any time without having to consult residents. They could move forward with the plan (as they did with the Willow Road Tunnel) even if an independent referendum were to show that residents substantially opposed the plan. Any other good arguments against the destruction of Crow Island Woods? Please post them below! My concerns transcend my immediate preferences. Rather, I believe the proposal to convert Crow Island Woods (north and south) is a community-wide concern. Crow Island Woods is an area that has unique ecological, educational and social value, which is not available elsewhere. – Crow Island Woods is not a vacant patch of ground. Rather, a mature woods in the middle of neighborhoods. * I talked to the Director of the Winnetka Historical Society. The Winnetka Historical Society has a 100 year lease with the Park District, which started in 2004. I understand that the Winnetka Historical Society does not intend to move the Schmidt-Burnham house again. The Winnetka Historical Society was not contacted during the Storm Water Alternatives study. * Over half of the oak saplings that were planted were grown from acorns saved and preserved from an actual Trail Marker Tree. For the native Indians, Trail Marker Trees were a creative means of communication and way to find needed materials for survival, as the trees pointed people in the direction of things like water or copper. * The inaugural event was April 26th, 2014. Dennis Downes, with the help of supporting groups, completed his vision years in the making. Dennis, Robert Smith (Executive Director of the Winnetka Park District), and Andrew Johnson (former Executive Director of the American Indian Center of Chicago) addressed the crowd, explaining the significance of the Tribal Council Circle and the history of the area. The purpose of this council circle was to help tie the citizens of Winnetka to the American Indian Center and as the trees themselves grow, the hope is that the bond between the American Indians of this area will grow with the people of Winnetka. * I talked to the Executive Director of the American Indian Center of Chicago. The American Indian Center of Chicago was not contacted during the Storm Water Alternatives study. The Tribal Council Circle was not mentioned in the Storm Water Alternatives study. Crow Island Woods = unique educational, ecological and social value. I invite you to join us in standing against the Crow Island Woods – South and North projects. Jeff has covered all of the crucial points. I would like to add that I am disheartened that we are even wasting time, money and energy considering a proposal like this. Not to rehash the past, but let’s take a look at why we’re even in this situation to begin with. Over the past fifteen years, Winnetka has become a community that I cannot relate to. New construction of massive homes on sites in flood zones has been occurring recklessly, and with no thought as to the potential consequences. Massive homes on flood plain lots, adding a burden to our already fragile infrastructure, is simply not a good idea. When people are astonished that their home is flooding, I am astonished that they are so surprised by this. We have allowed this to happen. While we were spending, contemplating, mulling, and voting over that engineering debacle of the Willow Road Deep Tunnel Project which would pour polluted waters into one of the world’s best fresh water reserves, we were foregoing the chance to take advantage of other possibilities such as buying Hibbard Road Gardens to build a water treatment facility. Now we need solutions. And we need to be smart. First of all, stop building houses that are too large for their lot size! Next, require that pervious materials be used on driveways, etc. Go ahead and buy a portion of Indian Hill, and make the water retention facility there. Give those guys a tax break, and I’m sure they’ll be fine. Heck, if you do it right, you can make it into a mini private water park using the treated water. Crow Island Woods, our parks and the Forest Preserve are off limits. Period. The Powers that Be who allowed all of the ridiculous home building are the ones who created this mess. They now need to fix their mistake. And not on our tax dollar. It is about time that maybe the village should investigate upgrading the size of storm sewer pipes carrying all this water. Maybe if we increased the capacity of these pipes it would relieve a lot of flash flooding we now get because storm runoff backs up due to full capacity of our inadequate storm pipes! Totally against this Crow Island swamp idea and am really surprised so many think it is a good idea. I attended the Village meeting last night (4/12) at Washburne School, and it is clear that much of the information on this site is misleading. Please remove the false statements and incendiary language. 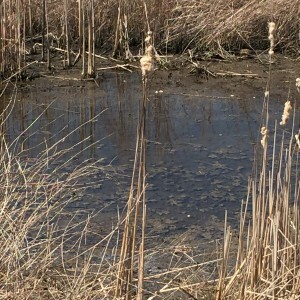 The plans clearly do not envision a “liquid garbage dump” and a “low lying swamp” that is “adjacent to the school” and a breeding ground for mosquitoes. There is no “unfair burden” imposed on nearby residents – the plan actually does the opposite by diverting local storm water away from nearby residents to this public property. All of these issues and concerns were addressed at the meeting. Do your fellow neighbors and Village residents a favor and become constructive participants in this dialogue. If you are opposed to the short-term inconvenience of construction on your streets then say so, but please quit the charade of false statements that have no basis in fact. Storm water management is an important issue for the Village that deserves an adult conversation. Jon, thanks for sharing your feelings and attending the meeting. I think we all learned quite a bit! Factual information about Strand’s proposals has been hard to come by up to this point, and the village website has made the information it does have hard to find. In the couple weeks since my family accidentally discovered the project, we’ve all tried very hard to get as much information quickly to as many people as possible. Even in that very short timeframe, quite a few of the plans and facts we’ve talked about and confirmed with Strand or the Village engineer have changed or turned out to be misstatements or inaccuracies, which poses challenges for all of us who are trying to decide what to think and do. In any case, I hope that our inquiries have led to wider awareness of these plans, better involvement of important community stakeholders who hadn’t previously been at the table, and a vigorous, adult community discussion that will help us find the right stormwater mitigation course of action for Winnetka. We’ve tried to present a balanced, fact-based viewpoint acknowledging both benefits and risks. Even the most emotional language on this website reflects legitimate worries of Crow Island neighbors which we’ve heard from dozens of people whose lives will be affected by the proposed changes. I thought last night’s presentation was well organized. Having listened closely, I still feel that there’s quite a ways to go to address some of the concerns you listed. I thought the presenters did a pretty good job of speaking to mosquito fears, though Strand consultants admitted that their anti-mosquito arguments apply specifically to the deep water version of the plan (which I suspect will be shelved because of safety arguments), not to the shallow marshy version. Adjacency to an elementary school and unsupervised child traffic isn’t really debatable, and may be the eventual killing blow. I can speak personally to the “no unfair burden” argument. Between the 10×5 culvert which is scheduled to run through my yard and Sunset Rd. access — we live on a dead end — the proposal and construction thereof will pose real, actual burdens that contribute to my position thus far. In a personal meeting with me, the Village Engineer also said that the retention basin would be designed so that — if it overflowed — it would do so towards the forest preserve through my yard. Strand framed the answer differently last night, but that’s one of those “wake up in the middle of the night” sentences that you really can never unhear. Again, thanks for being a part of the discussion! Thanks Chris, I appreciate the thoughtful response and candid discussion. I live close to Crow Island and can empathize with the fears about the project (while also recognizing the severity of the storm water problem at hand). I’m glad to hear that this forum endeavors to search for the facts and present them to the community, rather than allow emotional discourse, red herrings, and hyperbole to undermine the positive efforts being made by the Village to hear everybody’s voices and concerns. (I thought there was a lot of that with the Willow Road Project that hopefully will be avoided this time around). Thanks again for your efforts to encourage a reasoned dialogue on this topic.